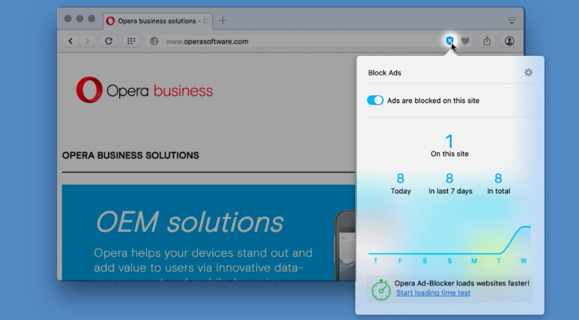 Opera Software today released a production version of its flagship desktop browser with an integrated ad blocker, along with a similarly armed version of its Opera Mini for Android. In March, Opera revealed plans to bake an ad-blocker into its browsers when it shipped a developer preview of the desktop Opera that included the technology. Rival browser makers, including Apple, Google, Microsoft and Mozilla, do not scrub pages of their ads themselves, but instead have taken a path of least resistance by supporting third-party ad-blocking extensions. Today, Opera again argued that it's included an ad blocker because customers want a faster browser. "We do this because we want to provide people with the fastest browsers in the market," asserted Opera CEO Lars Boilesen in a statement. "Our speed test shows that online ads slow down the browsing experience." But in March, Krystian Kolondra, who leads Opera's engineering, said that the Norwegian-made browser was integrating a blocker not only to accelerate rendering -- an obvious result of dropping any page content -- but also for evangelical reasons. "The [ad] industry should be making sure that ads are not ruining the user experience," said Kolondra in a March 10 interview. He also noted ad industry claims that it is working on creating ad types that are less intrusive and come with a smaller rendering penalty, but wondered, "Where are those better ads? If we could accelerate this change, there wouldn't be a need for ad blocking." The increase in browser-based ad blocking has raised the temperature of a long-running dispute between some users and many privacy advocates on one hand, and online advertisers on the other. The former cite the overwhelming number of ads on many sites and the tracking those ads perform, while the latter -- and the content publishers and service providers that rely on ad dollars -- claim that blockers are stealing money out of their pockets. Like the vast majority of commercial websites, Computerworld generates some of its revenue through ads. Browser makers, Kolondra argued, had the right to insert themselves in the conversation because of the slow load speed of some websites. "It's quite obvious that users care about speed," Kolondra said, in defending the integrated ad blocker. Even so, Opera "doesn't want to be in the ad-blocking business," Kolondra said. "We definitely don't want to create a living out of whitelisting." The impact of Opera's decision is unlikely to be significant, as its desktop user share has remained below the 2% bar since mid-2011. According to metrics vendor Net Applications, Opera accounted for 1.9% of all browsers used in April. Opera Mini had a stronger following, with an estimated share of about 6% of the mobile browser market. It's also not the first browser to adopt an ad-blocking strategy: In January, a new browser called Brave debuted with a business model that explicitly relied on blocking website ads. Unlike Opera, however, Brave plans to replace the stricken ads with its own, a plan that has drawn the ire of U.S. newspaper publishers, which a month ago threatened to sue the browser maker if it persisted. Interestingly, for all Opera's emphasis on the ad blocker, the tool is turned off by default. To enable it, users must pull up "Settings" -- on OS X, it's labeled "Preferences" -- head to the "Privacy & security" page, and click the box under "Block ads." It may have taken that route to sidestep the fierce criticism from advertisers that other browser makers have faced in the past when they switched features on by default: In 2012, for example, Microsoft came under fire from a long list of large American companies -- including Intel, McDonalds and Visa -- when it said it would enable the now-moribund "Do Not Track" signal in Internet Explorer 10 (IE10). Microsoft later stepped back from its Do Not Track position. Opera Software's board of directors wants to sell the company to a consortium of Chinese investors, which include Beijing Kunlun Tech, a mobile game maker; Qihoo, known for its search and anti-malware business in the People's Republic of China; and private equity firm Golden Brick Silk Road Fund Management. The group has offered $1.2 billion for the firm. Shareholders have until May 24 to vote on the proposed sale. According to Opera Software's fiscal year 2015 annual report, $418 million of its year-long total of $620 million in revenue, or 67%, was booked from its mobile advertising arm, which delivers ads to users from third-party apps and websites. Much of the remainder also stemmed from ads in one way or another: Opera was paid approximately $50 million, or 8% of the total, for setting Google or Yandex -- the latter is a Russian search provider -- as the default search in the desktop browser. Opera 37, the stable build for Windows, OS X and Linux, can be downloaded from the Opera Software site. Opera Mini for Android must be downloaded from Google Play.